Tag Archives: 어떤 전시회는 전화 부스와 TV세트 같은 모양의 물고기 탱크가 있어요. 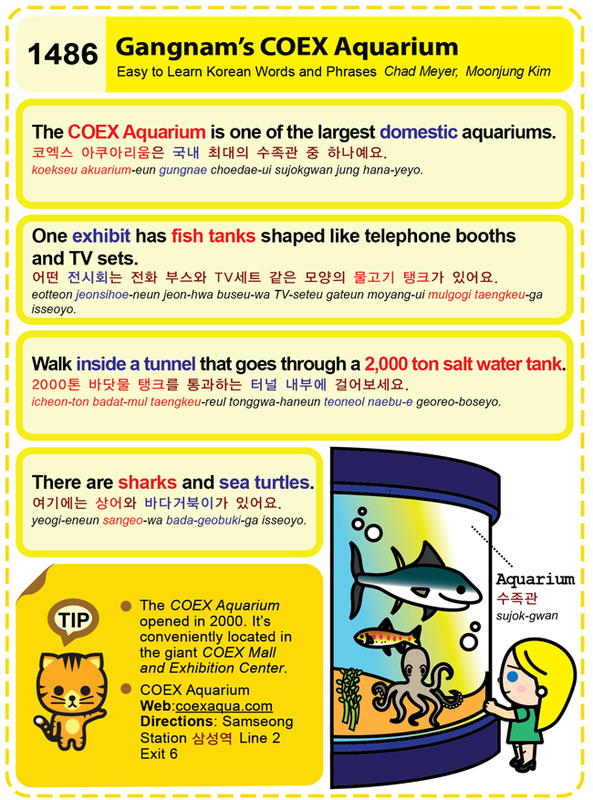 Easy to Learn Korean 1486 – Gangnam’s COEX Aquarium. Posted in Series	| Tagged 000 ton salt water tank., 2000톤 바닷물 탱크를 통과하는 터널 내부에 걸어보세요., aquarium, COEX, COEX Aquarium, COEX Mall and Exhibition Center, coexaqua.com, Gangnam, One exhibit has fish tanks shaped like telephone booths and TV sets., Samson Station, The COEX Aquarium is one of the largest domestic aquariums., There are sharks and sea turtles here., Walk inside a tunnel that goes through a 2, 삼성역, 수족관, 어떤 전시회는 전화 부스와 TV세트 같은 모양의 물고기 탱크가 있어요., 여기에는 상어와 바다거북이가 있어요., 코엑스 아쿠아리움은 국내 최대의 수족관 중 하나예요.